HERE TO SERVE—BUT FOR HOW LONG? : People’s Kitchen volunteers (from left) Gloria W., Dawn R., Deanne Jones, and Sandy Cano served lunch to Grover Beach People’s Kitchen attendees on Oct. 11. Between them, they have more than 34 years of volunteering service at the facility. Hours before lunch, a timer kicks on the coffee machine so it’s warmed up and ready to start brewing for the coming crowd. For most of the guests who regularly seek a hot meal at the Grover Beach People’s Kitchen, the coffee table is the first stop before they get in line for food. On the menu on Oct. 11: macaroni and cheese, barbecued lamb stew, mashed potatoes, salad, and cupcakes. A few days prior, there were pulled pork sandwiches. During a heat wave in September, volunteers made banana splits and root beer floats. For many members of the crowd of about 40 people gathered around the picnic tables, this may be the best—and perhaps the only—meal they’ll have that day. 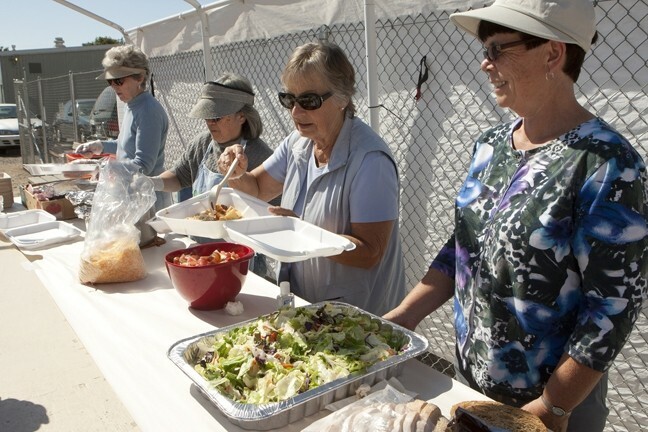 Serving lunch to food-challenged residents in south San Luis Obispo County has been the work of the kitchen for 21 years. Volunteers set up shop seven days a week, and each day one of 35 serving teams, predominantly church based, brings in and serves food. This longstanding daily routine may have to be put on hold, however, if the facility doesn’t find a new home base by the time its current permit expires; a long-term permit was denied by the Grover Beach City Council majority on Oct. 7. The kitchen is currently set up in a dirt lot on county-owned land that houses the old courthouse and Drug and Alcohol Services offices on the corner of South 16th Street and Longbranch Avenue. It’s been there since Aug. 1, after its previous location of five years at Shouts of Grace Church moved its church services to Arroyo Grande’s Clark Center. The location isn’t ideal, said Betsy Ehrler, president of People’s Kitchen, but it was going to work until they found something more permanent. The nonprofit organization secured a temporary use permit to buy time while applying for a long-term permit with the city. But it seems that while locals with an empty stomach look forward to visiting the kitchen, residents in the surrounding neighborhood loathe it. Before volunteers set the service up in the lot, locals formed the Longbranch Neighborhood Coalition and circulated a petition to urge the city to kick the kitchen out. Their reasoning: People who go there for lunch bring such trouble to the area as panhandling, vandalism, and theft. Neighbors contend that the kitchen acts as a magnet for problems. While the service’s physical presence is pretty minimal—they set up at 11:45 a.m., people come to eat at noon, and they’re gone by 1 p.m.—the trouble comes in the surrounding hours, said Fred Welz, a representative of the Longbranch Neighborhood Coalition. Welz points to the lunches as the trigger behind undesirable incidents in the surrounding area, which includes grocery stores and shopping centers. While the kitchen does a good job keeping everything in order during lunch, he said, residents are uncomfortable due to the before-and-after crowd. Residents turned out to air these concerns before the council on Oct. 7, saying they worried for their and their children’s safety (70 children live in the neighborhood). Welz, who talked to New Times as a representative from the coalition, is retired, following a career in public service and economic aid programs before moving to the private sector. Given his background, he argues that the kitchen’s model is “broken” and needs to adapt in order to minimize the impact to the community while carrying out its mission. In a sense, he argues, the kitchen operators need to own up to the unintended consequences, adjust accordingly, and segment their food delivery system, which currently operates at different locations and includes both pick-up sites and mobile delivery. Ehrler, on the other hand, said many of these methods either won’t work or aren’t compatible with the group’s mission, where a consistent, social atmosphere is crucial. Longbranch residents suggest a list of alternative sites in neighboring cities, including churches in Arroyo Grande and Pismo Beach. But those places won’t be accessible to many of the kitchen’s clients—more than half of whom live in Grover Beach and many of whom are without vehicles—Ehrler said. Even if they did work something out at one of those locations, the staff worries there may be another group of unwelcoming neighbors. It’s a dynamic that’s become a routine when talking about homeless services and food aid programs: Among the broad base of support for the cause is an acute base of opposition among neighbors. “Everyone says that they love People’s Kitchen and the things that we do, but nobody wants us to be near them,” Ehrler said. What both groups agree on is that there’s a need for a facility in the South County, where few services exist for people without homes or struggling to get enough food, and that support networks need to be revitalized. As it stands, People’s Kitchen’s permit will expire Nov. 22, which means they’ll have to pack up and leave days before Thanksgiving. On a recent afternoon, a young woman with a newborn baby sat with a man Ehrler said had been to prison twice before, and had told her he worried that without services offered by the kitchen, he might be at further risk to re-offend, which—even for something minor—would mean at least 25 years behind bars under California’s three strikes rule. “There’s so many people here. We have jobs or we don’t have jobs, or we have health issues. We need to eat, and I think this is a great place to help us,” another client, David Skillman, said as he sipped a cup of coffee. Skillman said he lost his job at a popular restaurant when it relocated. He was living with his brother at the time, until his brother could no longer afford their shared space. Now he’s looking for work and a place to live, all the while keeping current on child support for his son, who just enrolled in college at UC Davis. "It’s got to get better," Skillman said.